Monte Vista Elementary School offers an extra curricular "Young Astronaut" program designed to inspire its students to study hard through the excitement of space exploration. 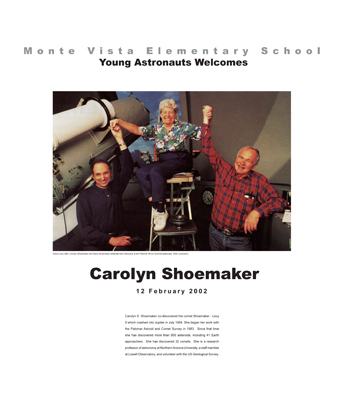 As part of the program, distinguished individuals have been invited to speak to the students, including Carolyn Shoemaker, who, with her late husband Eugene Shoemaker and David Levy, co-discovered the comet that crashed into Jupiter in July 1994; Harrison Schmidt, a student of Eugene Shoemaker's at Cal Tech and the first civilian astronaut to walk on the moon; Sid Gutierrez, a graduate of Albuquerque's Valley High School and a space shuttle commander who has spent a total of 20 days in space; and Larry S. Crumplter of the New Mexico Museum of Natural History who has participated in many NASA planetary missions, including the Viking mission to Mars and the Magellan mission to Venus. Anthony Anella served as a parent volunteer in support of the Young Astronauts Program and was personally responsible for bringing Carolyn Shoemaker, Harrison Schmidt, Sid Gutierrez and Larry Crumpler to Monte Vista Elementary School.